“I want to run my own coffee shop one day. And I want kids from all over the world to come and share this coffee with me," said Julián Murillo, 8. 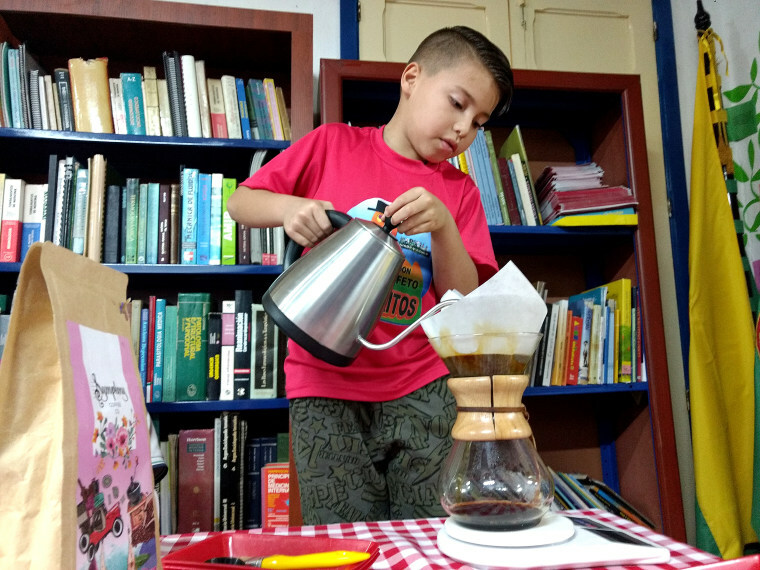 MARSELLA, Colombia — At a library in the heart of Colombia's coffee country, Julián Murillo, 8, proudly narrates the process as he makes a meticulous Chemex-method brew. He places a filter-lined funnel atop a glass flask and carefully doles out the speciality coffee — produced and roasted locally — in the centre of the filter paper, before pouring the hot water over the top and watching the dark brown brew drip down. For now, Julián is learning the skills just for fun, but there’s a larger goal in mind: Low coffee prices, climate change and a rapidly-aging coffee work force mean it's more important than ever to get kids excited and invested in keeping the coffee industry here thriving. If kids like Julián don't stay on the land, Colombia's smooth Arabica coffee, served by cafe chains around the globe, could disappear — but if programs like these succeed, the next generation could preserve Colombia’s centuries-old culture while providing better local jobs and better-tasting coffee for local consumers. “We’re bringing together not only the generations, but different parts of the production chain." In a town a three-hour drive away, Jorge Suarez, 26, has just made his own dream come true — he now has his own coffee shop serving the coffee from his parents' farm. That’s thanks to seed money and training from a program called Coffee Kids, run by the Hanns R. Neumann Foundation. The Hamburg-based NGO was founded in 2005 with the mission of improving the livelihoods of smallholder coffee growers and it says it has helped 266,000 farmer families in 22 countries since then. Alejandro Cadena, Bogota-based CEO of green coffee exporter Caravela Coffee said a recent survey of producers found only 39 percent of family farms had working-age children on them. Roberto Velez, chief executive officer at the Colombian Coffee Growers Federation told NBC News that only 10 percent of Colombian coffee farmers are looking at coffee as a business for the next generation. “The youth don't believe in coffee growing as a way of life,” he said. CORRECTION (Nov. 21, 2018, 5:20 p.m. ET): An earlier version of this article misstated the nature of Caravela Coffee. It is a green coffee exporter, not a specialty roaster. Andrew J. Wight is a freelance journalist based in Medellín, Colombia.